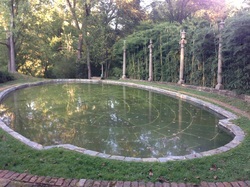 Site of our latest projects, the historical Gardens at Dumbarton Oaks, in Georgetown, Washington DC. Hugh Livingston has been resident artist in the gardens, creating two sound environments which create a dialogue across the 18-acre garden. The first installation process began in spring 2014 (with three inches of snow at the end of March! 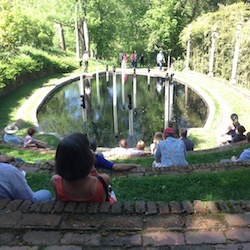 ), opening at the Dumbarton Oaks conference on Sound & Scent in Gardens, May 9-10, 2014. The installation will be audible and visible through 2017. The second installation was added in March 2015, and can be previewed here. Read more about the Gardens on their website. This spectacular but intimate garden just appeared on National Geographic's list of the Top Ten Gardens in the World! The brick seating was designed by Beatrix Farrand to replicate an ancient Roman amphitheater on the Gianicolo in Rome. The 'stage' is mysteriously a pool, which once reflected silver maples planted in the grassy area creating a slight overhang and a strong degree of verticality now missing from the site. 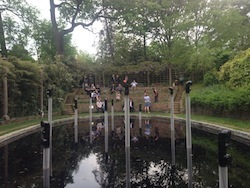 The 12 'organ' pipes rising up out of the water, cast in clear acrylic, are arrayed like an opera cast on the stage, and the soundscape is experienced both in sum, by sitting on the 3 tiers of brick in the foreground, or individuated, by walking the perimeter of the pool. The sound also drifts down Melisande's Allée, a meandering brick path that starts at the pool and descends down to the creek between towering trees. The gardens are open for viewing daily except Monday from 2-6 (til 5 in the winter months). "I was bowled over by the two sound pieces - superb music to be more accurate - that you have installed there, and which I enjoyed immensely. They are each in their own ways as lovely as they are thoughtful, beautifully conceived and sited. Congratulations." — Summer 2015 comments from a prominent landscape architect. View showing colonnade of imitation Greek columns in cast concrete, amidst bamboo grove (and a high degree of vertical elements). Three tiers of brick seating; arbor behind. 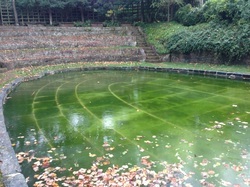 Martha Stewart visited and commented on the algae. But we have dyed it black to control algae and for a high degree of reflectivity! The final results, with the Mother's Day opening weekend crowd taking it in on all sides. Looking up towards the amphitheater on a cloudy day. 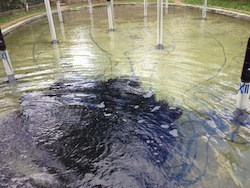 Last look at the infrastructure built by Walter Howell in the pool before the dye is cast. 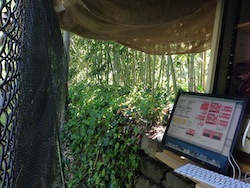 Dumbarton Oaks Mothers' Day Timelapse: The Pool of Bamboo Counterpoint from Livingston Sound on Vimeo. PoolDay11 Dye from Livingston Sound on Vimeo.